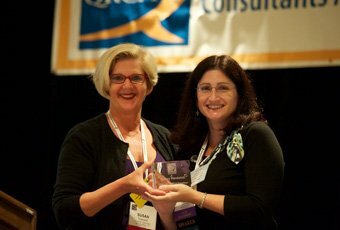 Susan Thornhill (left) awards Nancy Hardwick (right) with the “Big Cheese” in honor of Nancy’s term as QRCA President 2010-2011. Nancy served on the QRCA Board for four years. Click on the following links to read Nancy’s letters written during her tenure as president of the Qualitative Research Consultants Association (QRCA). Some provide detail on benefits of QRCA membership while others provide a unique perspective on research. Nancy was featured in a blog post on New Qualitative Research, “Projectives in Practice” which was a presentation given at the 2011 QRCA conference. Read the blog post Online Projectives: It Could Be Anything! She also presentated multiple times on the topic of making your reports more visual including the QRCA Conference (October 2013) and a QRCA Qcast Webinar (August 2014). View the webinar.